Online Music Store How To Get A Refund From Spotify? For some years now, the inclusion of music streaming services including Tidal, Apple Music, Amazon Music Unlimited and other streaming services have been beneficial to many people. Instead of listening to CDs or discs, people now prefer streaming music on the tablets, iPad, iPhone, PCs and other places as an easier way of listening to music. But with the rise of the services comes with the pros and cons too. One streaming service that has been facing criticism in recent times is, Spotify. Spotify is one of the music streaming services available today, most people have subscribed to its services and they are enjoying it. Subscribers are faced with many hassles and issues in recent times. Spotify is simply the best and easiest way to find the right music on your phone, tablet, computer on more. Spotify has over 30 million tracks in its music library, meaning whether you are looking for a relaxing, partying or workout session music, you will always get one that suits your needs. Subscribing to Spotify means you have the right kind of music at your figure tips. You can also create radio station or your own curated collections or playlist and sit back and enjoy. One major setback of Spotify comes with getting a refund after you have paid for a subscription. Although some people call it a setback, to some it is not a setback if you know the steps to follow whenever you need a refund for subscriptions. This post will cover some simple steps you need to follow to get a refund. But what are the reasons for asking for a refund? Asking for a refund from Spotify is not as easy as subscribing to streaming services. There are different reasons why people ask for a refund. Depending on your reasons, you can get a refund or not. Spotify has different subscriptions from a free account, students, premium to family accounts. •	Strange charges: lest say maybe you are double charged for services or you don’t understand why. •	Unsubscribed from the service, but you are still charged. There are many questions and comments on the Spotify community of people complain about being charged even after unsubscribing from certain services. •	You don’t get the services promised. Example: promised offline services or a certain amount of music you can download but it never happens. •	Spotify won’t provide support. This is an issue with just a few people, but it is also the reason for asking for a refund. These are just some of the reasons why people seeking for refund. However, not all of these demands entitles for a refund. You need to know if you are eligible for a refund or not by contacting Spotify customer care services. Here is a tutorial to help- you get a refund. If you have been double charged or canceled your account, but you are still charged, you don’t need to worry. 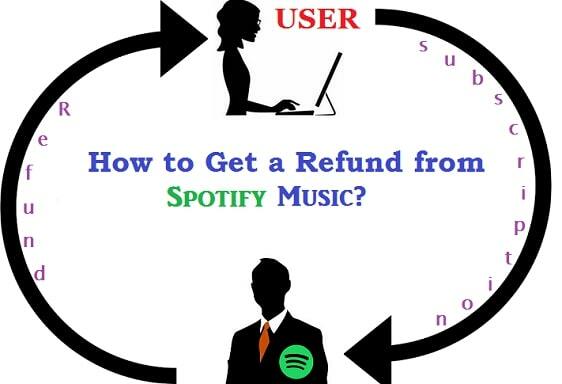 By following these easy steps you can get a refund from Spotify. Here is what you need to do. 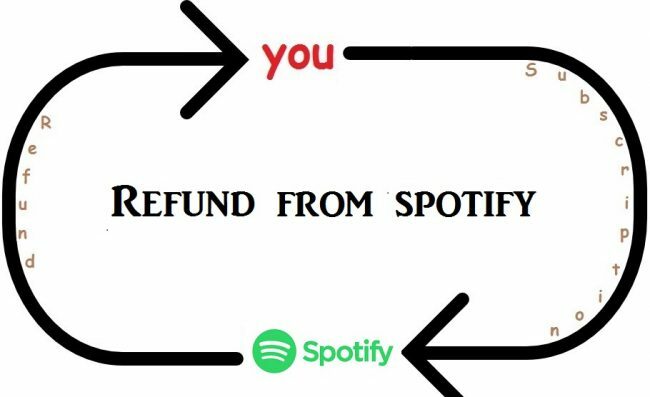 Before you contact Spotify about a refund, first check your credit card statement and make sure Spotify charged you incorrectly. •	Log in to your account using either your Facebook account if you have forgotten your username. •	Once the account screen opens under select a topic, click the first option and you will see a blue box at the bottom of the screen. The blue box says, “I still need help”, click on it. •	Choose your type of subscription. If it’s premium, choose premium. •	Enter date of birth, type your zip code and your full names. •	In the <> text field, write what you want. Your query, something like; Hi, I want to request a refund for my Spotify subscription. •	Send your request and you will receive an email in your email box regarding your request. Spotify refunds don’t take place immediately after placing a request. If you are eligible for a refund, you will get your refund back to your bank in full after 14 days of purchase or of placing a request. Please note, there are situations where you can’t be refunded by Spotify. Refunds from Spotify don’t apply in some exceptional situations.